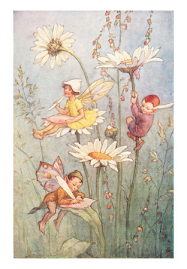 Four little fairies came through a crack in the garden one night when the wind was warm and the stars were bright. “What a lot of noise,” said the fairy in pink. “What a lot of Big People,” said the fairy in gold. The Big People were having a party in their garden. Lots of children were running and playing. Some of them were jumping on the trampoline. So the four little fairies crept away from the crack towards the camellia bush. The children had taken their sandals off to jump on the trampoline. 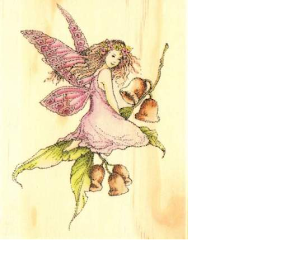 The fairy in pink waved her wand over the sandals, sprinkling a little magic. When the children put their sandals back on, they were surprised to find how fast they could run. Once they reached the bush, the fairies flew up into the flowers. Now that they were safe, they had fun watching the children play. “What are they doing now?” asked the fairy in pink. All of a sudden the Big People were calling out, “Happy New Year! Happy New Year!” They hugged and kissed each other. “What happy people,” said the fairy in gold. “But what's all that banging noise?” asked the fairy with the dusty moth wings. “Look up there,” said the fairy in blue. The Big People were looking up at the sky. The fairies looked up, too. What they saw was so wonderful that they hovered right outside their flowers to see. “How beautiful,” the fairies said. They were watching fireworks. Beautiful sparks filled the sky in more colours than the rainbow. Green and blue, gold and purple, red and silver and pink. They blossomed like flowers and sparkled like stars. “Where is that little spark going?” asked the fairy with the dusty moth wings. One little, silver spark was flying in a big arc towards the earth. All the fairies flew to where the silver spark had fallen. It was difficult. They had to dodge among the Big People without being seen. Then they found her. She was a beautiful little fairy with silver wings. “A brand new fairy,” said the fairy in pink. “A brand new friend,” said the fairy in gold. “A New Year fairy,” explained the fairy in blue. “What pretty fireworks this year,” said the Big People.